Want to write a novel? Storyblue can help. Storyblue helps you stay motivated and organized, so you can finish your novel. Stop shuffling through stacks of index cards to find that lost character. Storyblue organizes your scenes, characters and notes for you, so you'll never lose another card! Storyblue charts your daily word count so you can see at a glance how you're doing, and when your best working days are. Write faster with less distractions in Storyblue's simple, focused writing interface. Your notes and chapter layouts are always readily available. Set writing goals for yourself. Storyblue tracks your progress so you can see where you are, and what you need to achieve your goal. 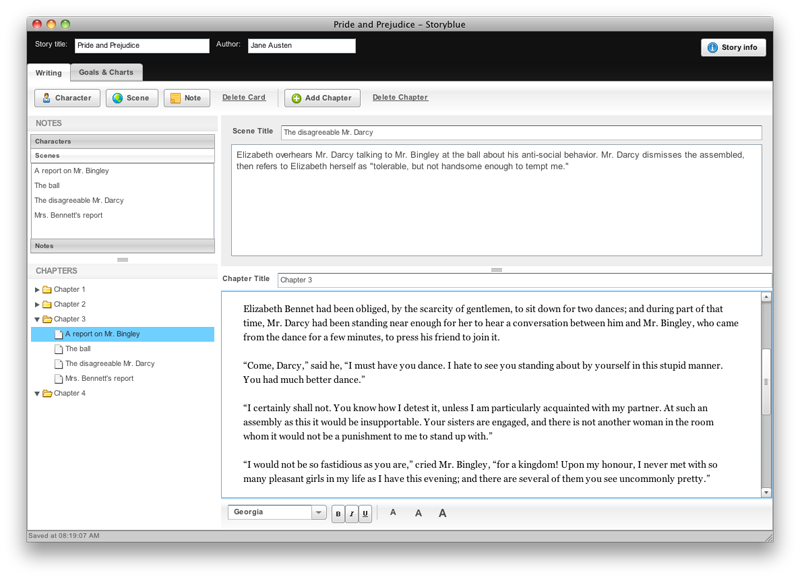 If you've ever wanted to write a novel, Storyblue can help. See your word-count grow day-by-day with our charts, and set daily word goals to help motivate yourself! 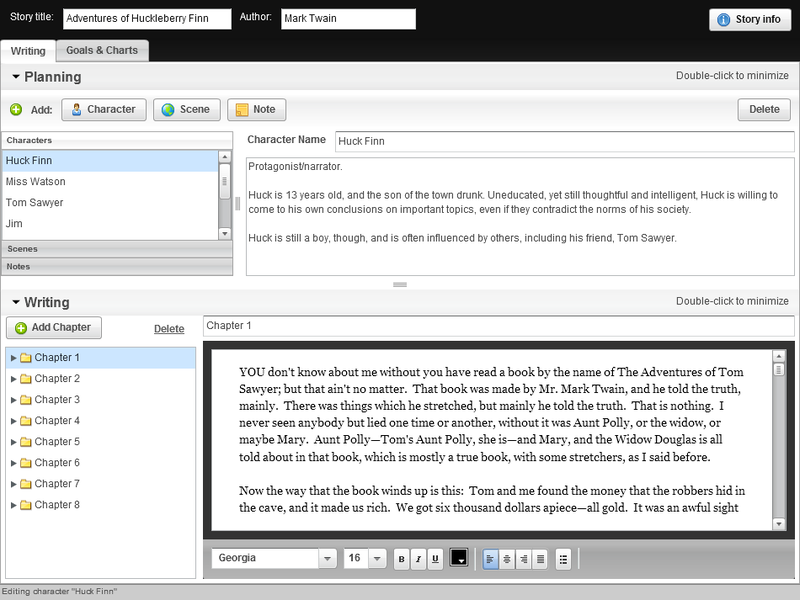 We offer a free limited trial version, so you can see if Storyblue is right for you. If you like it, you can purchase the full, unlocked version and immediately continue noveling! Writing a novel is a long and difficult process, and every writer creates his or her masterpiece differently. There's no “silver bullet”, no magical book-writing software that will make fully-formed characters and vibrant scenes spring from your fingertips into the hands of publishers. Why use Storyblue, then? Here's why: What novel-writing software can do is provide an integrated, focused environment that lets you, the writer, do everything you need to do in order to get to those awesome words, The End. Storyblue does this best. We've integrated the planning process and the writing process together into a simple, easy-to-use interface that puts all your careful plotting right at your fingertips while you write. There's no additional fluff, no forms to fill out or structures to follow, just you, your characters, scenes, notes, and chapters, right there in one interface. It's brilliant, if we say so ourselves :). We've also just added charts & goals, which make Storyblue even more awesome for writers. Where else can you see charts of your daily word-count, and set daily writing goals to motivate yourself, all in one simple, novelist-focused interface? Your novel is waiting. Adventure, drama, romance, intrigue — all right around the corner of your imagination. Go ahead: Dream a little.